*If you would like to take part in sharing a story regarding chronic illness then please do get in touch via my contact me page. You can be of any age, a parent of a chronically ill child, a friend, a carer or completely anonymous. It is all about sharing our experiences in order to help each other and realise that we really are not alone in what can be such an isolating time in our lives. I was recently contacted by, Claire who has asked me the share the below with you all. 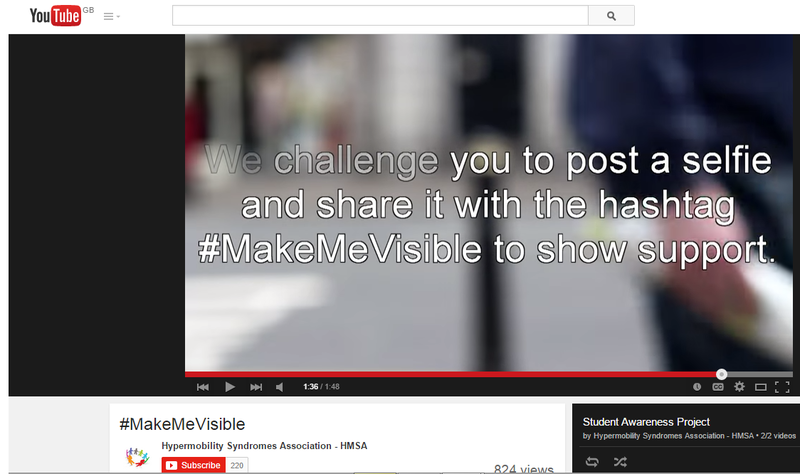 Please get involved with the #makemevisible project. "Hi, I'm currently in my second year studying Media. For our group coursework this semester we had to choose an organisation/company within Europe to create a media project for. I myself have hyper-mobility syndrome, and also have ambitions to work for a charity one day. While most groups were choosing small, local places to have as their clients, I convinced my group that we should do an Awareness Campaign and we were very lucky that the HMSA team were willing to be our client for the project. We're making a short video series, 5 is the plan." Please get involved with Claire's Campaign which is in support of raising much needed awareness for invisible illnesses. Claire is challenging those with invisible illness to post a selfie on social media with the hash tag #makemevisible along with the name of their illnesses. I was recently contacted by Katie who asked me to share the below. "All chronic illness sufferers, whether male or female, experience frustration when dealing with the medical system. But if you’re a woman, whether you realize it or not, your struggle is going to be much much harder. First of all, women are disproportionately affected by chronic diseases that are life-long and that greatly affect one’s quality of life such as autoimmune disorders, fibromyalgia, chronic fatigue syndrome, and most chronic pain conditions. Considering women’s predisposition to these disorders, you’d think doctors would be quicker to spot them when a woman comes into their office, but it’s actually quite the opposite. For instance, even though women are more likely to suffer from chronic pain disorders, women are less likely to be prescribed pain medication for their ailments. In fact, studies have found that doctors in a pain clinic were more inclined to prescribe men opioid pain medications while giving women tranquillizers. That is, doctors give men medication to relieve their pain whereas they give women medication to shut them up. Even when an organic cause for a woman’s pain has been identified, doctors are still apt to attribute women’s pain to psychological problems and prescribe her antidepressants instead of pain relievers. Even in children who’ve had surgery, doctors will give boys strong pain relief while giving girls Tylenol. Medical sexism extends to essentially every area of medical practice. Women are less likely to be diagnosed as having a heart attack, even when presenting with identical symptoms as men. Doctors are twice as likely to attribute a woman’s even “textbook” symptoms of heart attack to anxiety and are seven times more likely to send a woman home from the ER during a cardiac event. Women are 22 times less likely to be referred for a knee replacement, with identical moderate symptoms. Women are less likely to be put on a kidney transplant list. Even young girls are less likely to be put on transplant lists, so the disparate treatment starts essentially at birth. Knowing all of this, what can we as patients do to advocate for ourselves? First of all, if your doctor isn’t taking you seriously, find a new one. If the next one doesn’t take you seriously, find a third, and so on. It is not uncommon for women to have to go to half a dozen doctors before she finds one that will give her appropriate care. In autoimmune disorders, for instance, it takes on average five years and five doctors before a woman is diagnosed.Secondly, and I hate suggesting this because this should not have to be the case, but when you go to the doctor, especially a new one, bring a man with you. Doctors will admit that they take women more seriously if her husband or father is there to validate that her symptoms are real and that she’s not crazy. It’s terrible that a woman needs a man behind her agreeing that she really is sick before a doctor will do a full workup, but it’s a fact. Some women, and even some doctors, advocate for women to see women doctors. However, the data about whether female doctors discriminate against women less is not entirely clear. There are some studies that show that women doctors are just as discriminatory as male doctors. However, there are other studies that show that female doctors are better listeners and therefore more likely to make a proper diagnosis. So, it may be a good idea to seek out a female doctor. From the many women I’ve spoken to anecdotally, I’d say you’re better off with a highly competent doctor than one of a particular gender. Talk to your friends and try to get a good recommendation. Finally, there needs to be a sea change in the medical community. Doctors need to stop assuming women are hysterical and that their symptoms are all in their heads. To that end, I’ve started the blog Miss•Treated. It’s a place for women to share their stories of being dismissed by doctors so that we can expose the medical sexism that is usually hidden behind the doctor’s office door. When women share their stories, they begin to take their power back. And more importantly, once I’ve collected hundreds of these stories, no one will be able to argue that this isn’t a serious problem. So please, if you relate to what I’ve written here; if it’s been a long road to diagnosis; if you’ve been told by a doctor your symptoms are all in your head: Submit Your Story. Because women shouldn’t need to see five doctors or bring a man along with them before they get competent medical care."